You are here: Home / events / secretsundaze x Go Bang! 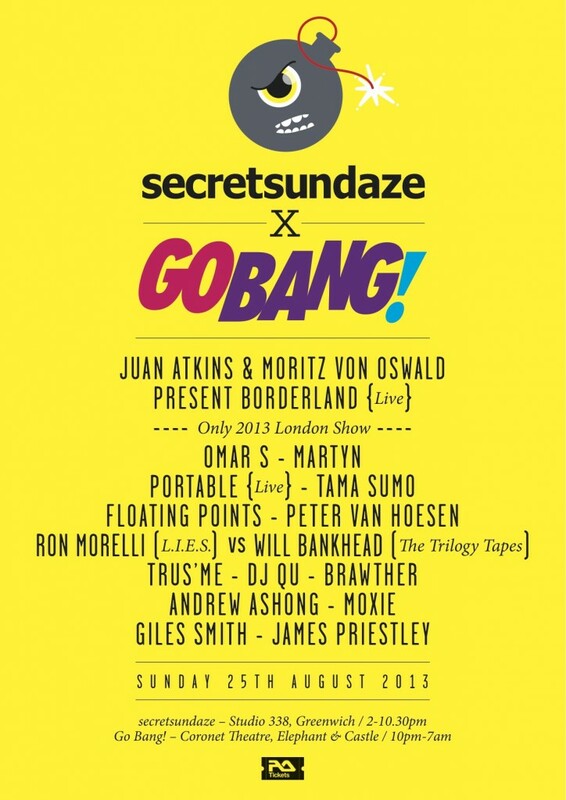 secretsundaze returns for August Bank Holiday Sunday with the second edition of GO BANG! The secretsundaze x Go Bang! mini-festival presents some of the most special electronic artists, embracing a broader musical vision than many other conventional house and techno events. And for its second year, secretsundaze x Go Bang! comes at you by day from the terrace at Studio 338 in Greenwich – the scene of the massive secretsundaze Summer Opening Party with Derrick May – and by night takes over The Coronet Theatre in Elephant and Castle. Headlining is Juan Atkins & Moritz von Oswald present Borderland (live) – a project and collaboration from Detroit pioneer Juan Atkins and one of Germany’s most important electronic producers Moritz Von Oswald, this is their only 2013 London show. Having worked together on and off over the last two decades on their 3MB project, they have reconvened to produce their first LP on German bastion of techno Tresor under a new alias, Borderland. Tracks from the LP such as ‘Electric Garden’ and ‘Footprints’ combine subtle sumptuous electronic grooves with their high-end production values. They have transformed this body of work into an unmissable live show. secretsundaze x Go Bang! is a rare opportunity to see these two giants of the scene perform together. secretsundaze welcomes Omar S – the freshest and most standout Detroit producer and DJ of recent years, whose uncompromising and unique vision of house and techno, coupled with his undeniable confidence and swagger, has breathed new life into the genre. He’s released three LPs and what seems like a constant stream of quality 12”s on his own FXHE label. 3024 man Martyn’s sound fits with the Go Bang! concept of cutting-edge dance music in the broadest sense, with his hybrid of house, techno, bass and breaks. He has an LP set for September release, the follow-up to his well-received ‘Ghost People’ on Flying Lotus’s Brainfeeder last year. Portable – previously known as Bodycode – is another unique artist, with his fantastic live show that has seen him play the best clubs worldwide. He has a great presence as a performer, with his custom-made outfits and live vocals never failing to leave a lasting impression. He has an LP set for Zip’s legendary Perlon in the coming months. With the most enviable residency in the world at Panorama bar, Tama Sumo is quite simply one of the best DJs secretsundaze have heard, with a culture for great house and techno across the board. Floating Points has been on secretsundaze’s hit list for some time. He defies categorisation with his take on house, techno and boogie coming together to make an irresistible and charming sound. His DJ sets are the stuff of legend, with Ben UFO name-checking him as the DJ he most likes to hear. Bringing the noise is Belgian artist Peter Van Hoesen. Along with DVS1 and Mike Dehnert, Hoesen is a very special breed of techno artist known for his exemplary long sets at Berghain. His sound ranges from mesmerising, heady, warm techno to the tougher stuff – always impeccably programmed. Other special additions to secretsundaze x Go Bang! include an-all night session from the oh-so-hot pairing of L.I.E.S. kingpin Ron Morelli and The Trilogy Tapes’ Will Bankhead, two of the most interesting imprints to emerge in recent years with roots in house and techno but very much left of centre and bringing something new to the table. DJ Qu is one of the new breed of New York producers and DJs making waves with his sets and productions having a unique edge that takes influence from classic US sounds but darkening it up, making it more edgy. Manchester and Prime Numbers head honcho Trus’me also steps up – a great DJ who can comfortably navigate all that is good within house and techno in 2013. Brawther returns to secretsundaze x Go Bang! 2013 following his excellent set in 2012. One of the most talented house producers today, his releases on the Balance and My Love is Underground are some of the biggest selling house records of the last few years. London’s Andrew Ashong has been tipped for big things with his work both as a solo artist and alongside Theo Parrish with their beautiful ‘Flowers’ track from 2012 – and now his new release on Theo’s new imprint Wildheart is getting chins wagging. His music has a great earthiness and bags of soul. Hot property Moxie – one of the original faces on NTS radio, and still a driving force with her own fortnightly show, brings her own inspired selection to proceedings, demonstrating an extensive and diverse knowledge and technical excellence, and making the dancefloor very much her own. In August 2012 secretsundaze Go Bang! arrived in Camden at the Roundhouse by day and Proud Gallery at night with a stunning, diverse lineup that brought together Four Tet, Levon Vincent, Ben UFO and Mathew Herbert, among others, for an incredible event. Now secretsundaze is proud to announce secretsundaze x Go Bang! 2013, and reveal details of this year’s day-and-night extravaganza. secretsundaze x Go Bang! provides a day-and-night experience that brings together a truly forward-thinking lineup across two special secretsundaze locations. Block the date in your diaries for what is bound to be one of London’s hottest dates this year! More acts added to the Snowbombing line up.